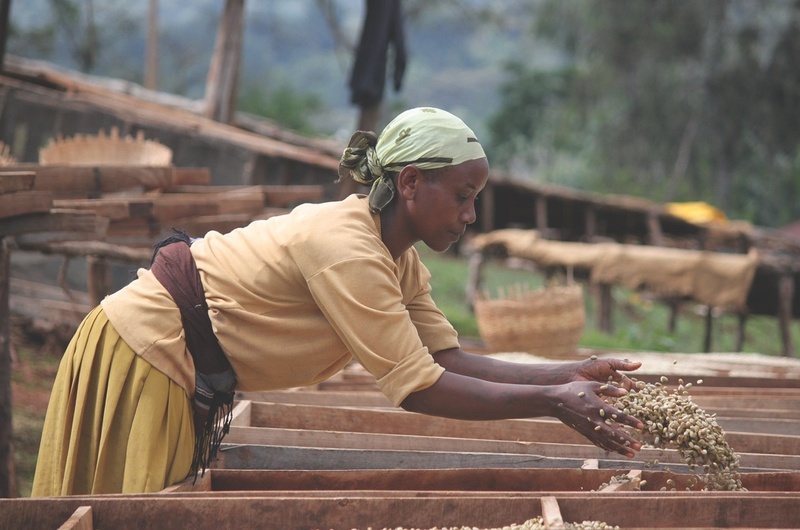 Ethiopia is the cradle of coffee and it has the longest history in growing coffeetrees. Sidama district has over 70,000 farmers (small holders), who have represented by 47 cooperatives. Each farmer is the master of his/her field and cooperation’ task is to process the bean, categorise it according to quality and sell it. Nearly all coffee producers grow their coffee in shade in low density under the canopies of indigenous trees (banana). Between coffee trees they grow their staple food crop. Thanks to this Sidamo farmers fields resemble more to a jungle than to a agricultural landscape. They have practised this garden coffee production system more than 30 years and it has shown that this keeps the trees healthy and the quality of the berries is high. Coffee is grown near homesteads and usually there are 1000 to 1800 plants per hectare. Yirgacheffe is a relatively compact growing district in Sidama region, in South-Ethiopia. The district is well known for its unique taste of coffee beans and is considered by many specialists as a region where the best coffee beans in the world come from. Yirgacheffe is also thought to be the birthplace of coffee. Today the district produces yearly about 30,000 tonnes of coffee. Obviously this makes coffee as one of the most important crop and income source for the 8 ethnic group in the district. We could easily say that coffee is part of their every aspect of social life. Depending on altitudinal variation and rainfall distribution, the harvesting period varies from September to December. Harvesting is mostly done by family labour. Unfortunately many farmers are facing today changing climate, which has caused unpredictable weather events and shifting seasons. Most importantly, lots of uncertainty. Thankfully, thanks to small-scale, family based farming, they have adapted fairly well so far. Once the coffee has been harvested, it is brought to the cooperative wet mill. There the coffee is processed in four steps. 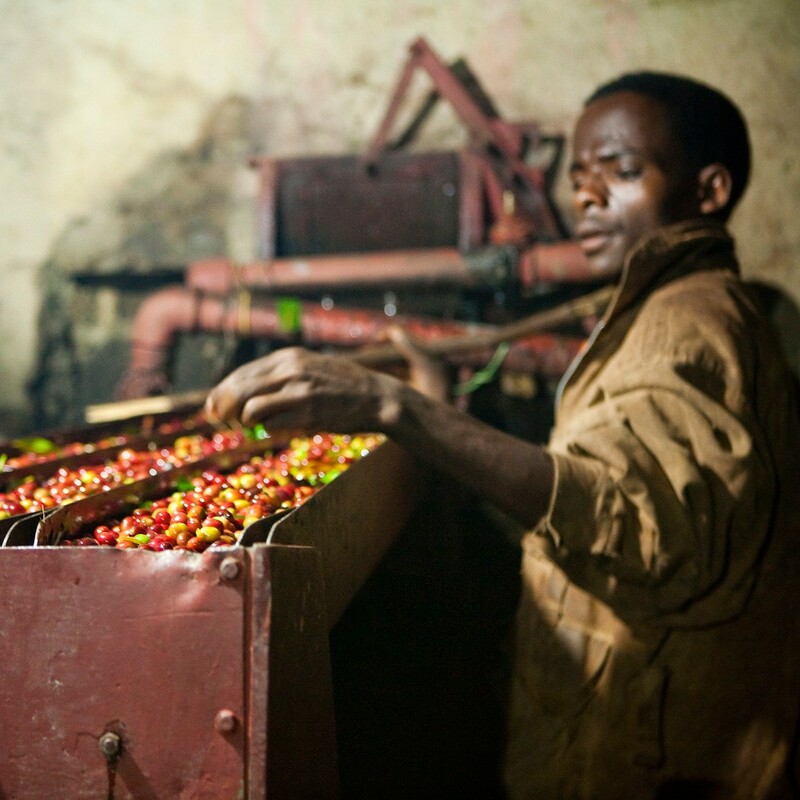 First, harvested coffee cherries go to a pulping machine, which separates the bean from the fruit. The pulp is washed away and beans are fed to the fermentation tanks. Then, the beans stay in the fermentation tanks for 10 to 64 hours. Here the mucilage layer is broken down and the coffee’s flavour is naturally enhanced. After fermentation the beans are washed to remove the sticky fluid that has come from the fermentation process. Finally the washed coffee is taken on the hills of mountain, where it is spread on drying trays to dry naturally in the sun. Dried coffee packaged into 60kg bags and stored in coop warehouse until it is delivered to Addis Adaba, capital of Ethiopia, for exporting around the world. Some of it may be in your coffee mug.